John Taylor Dinnis was the first-born child of George Dinnis and Catherine Taylor. 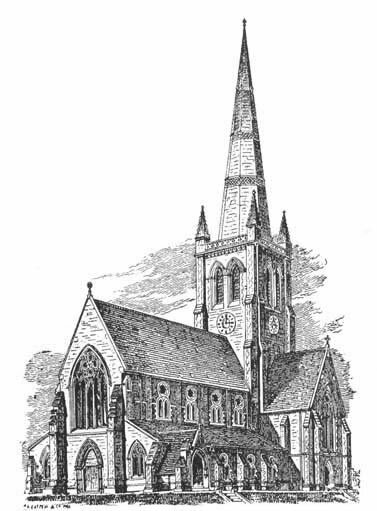 He was christened at Holy Trinity Church in Islington, London on July 8th 1877. 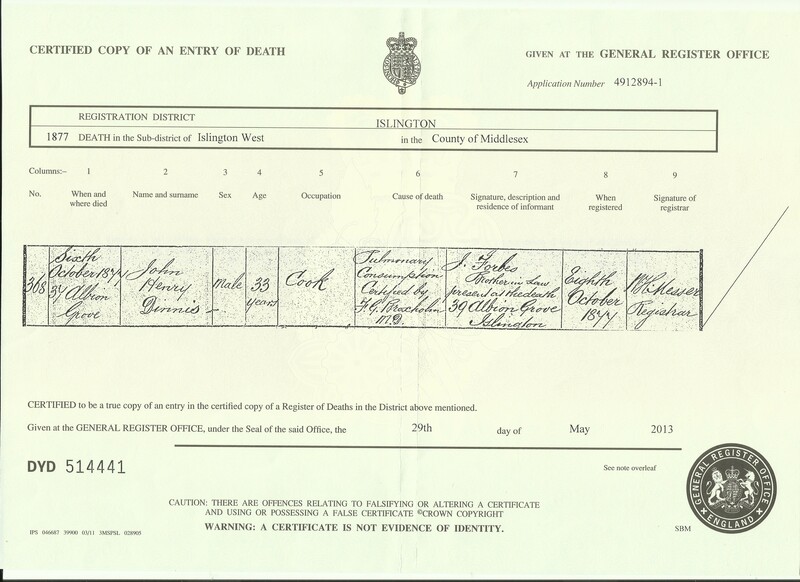 From the details given below, we can see John Taylor was christened at the same date and place as Edith Beatrice – the first-born of George’s sister, Fanny and her husband John William Forbes. George and Catherine were my great grandparents. George, Catherine and little John Taylor lived in the Old Kent Road, London. George was working as a Hotel Cook. The next information I can find is the sad death of John Taylor Dinnis. I can only imagine how devastating this must have been for the family. The cause of death is Tubercular Meningitis, and was on the 15th February 1878 at 28 Peplen Road, Old Kent Road, London. 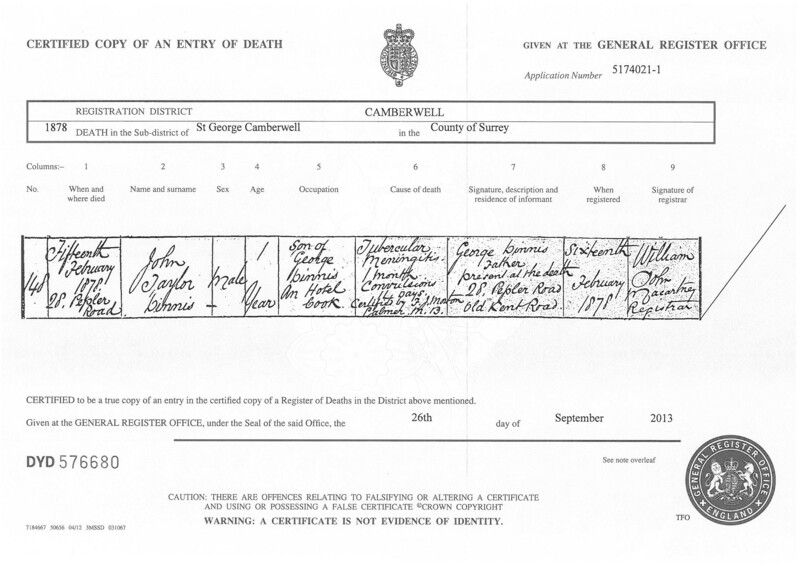 It states that John’s father, George Dinnis was present at the death. This had been a very traumatic time of highs and lows for the family. Two weeks after the christening of the two babies, John Henry Dinnis (George and Fanny’s elder brother) married Jane Catherine Evans. Then on the 6th of October that year (1877) John Henry died from Pulmonary Consumption. The address given for Fanny Dinnis and John William Forbes is 39 Albion Grove, and for John Henry Dinnis – 37 Albion Grove. It appears they were a very close family, and hopefully they all helped one another through the difficult times. This entry was posted in Catherine Taylor, DINNIS, Edith Beatrice Forbes, Fanny Dinnis, George Dinnis, Jane Catherine Evans, John Henry Dinnis, John Taylor Dinnis, John William Forbes and tagged Baptism, christening, Family History, History, Holy Trinity Church. Bookmark the permalink. Really interesting thank you 🙂 Maybe that’s why they had such big families back then, they just half expected to lose one or two. The comment you make regarding ‘when they did die you weren’t supposed to dwell on it’ sounds just like some of my long gone relatives and their way of dealing with stuff! I’m sure they grieved as much as we would, just because it was more common, surely it wouldn’t hurt less? I don’t know!! If I may add my two cents, instead of being so specific with your tags, go with History, Family History, etc. Specific names are more for categories. Your site deserves more exposure. LOL, Just remember, not more than 10 tags or it gets jammed up and will not appear in the Reader under any of them. Aw, that’s so sad :(.